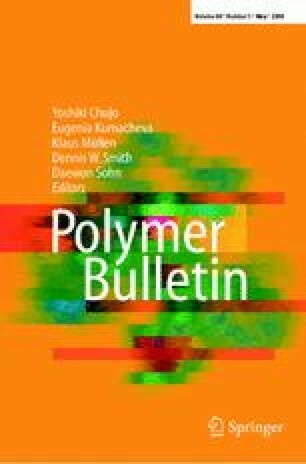 High dielectric constant copper phthalocyanine oligomer (o-CuPc) was chemically grafted to poly(p-chloromethyl styrene) (PCMS) to improve its dispersibility in PVDF. From SEM results, the size of o-CuPc-g-PCMS particles in the blend of poly(vinylidene fluoride) (PVDF) and o-CuPc-g-PCMS (o-CuPc-g-PCMS/PVDF) was about 70nm, less than 1/7 the size of o-CuPc in o-CuPc/PVDF. In addition, o-CuPc-g-PCMS in o-CuPc-g-PCMS/PVDF showed much improved dispersibility. Both of the improvements obviously enhanced the electric properties of the composite. The dielectric constant of o-CuPc-g-PCMS/PVDF was more than 325 (100Hz), which was about 7 times higher than that of o-CuPc/PVDF. The dielectric constant at high frequencies (∼1MHz) was also high (∼130).